My big kids love mini cakes. Other than chocolate cakes, they love lemon zesty flavour cakes too. Friands are quick and easy to make. However some recipes require the use of electric mixer (Fruited Friands which I attempted earlier this year). 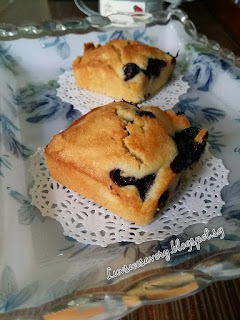 Regardless, most recipes I've come across do not require the use of electric mixer ... just a fork to beat the egg white, add and stir the wet ingredients to the dry ingredients :) A muffin pan comes in just as handy if you do no have nice and dainty traditional Friand pan. Below my slightly modified version as I've halved the recipe. 2) Preheat the oven to 180°C. Position the rack in the centre. *The temperature of the oven may vary, do adjust the temperature and timing to suit your oven. 3) Melt the butter and leave to cool. 4) Sift the plain flour and icing sugar into a large bowl then add the lemon rind and ground almonds. Stir to combine evenly with a manual whisk and make a well in the center. 5) Add the egg whites and melted butter to the dry ingredients and stir gently until just combined; do not over-beat. 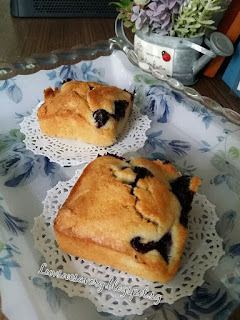 Gently fold through blueberries with a spatula (don't over-mix or the batter will turn blue!). 6) Evenly fill about 3/4 in each greased muffin cup using an ice cream scoop. Bake for about 25 - 30 minutes until golden brown and just firm to touch. Check for doneness with a skewer/toothpick inserted comes out clean. 7) Leave in the pan for about 5 minutes before transferring to wire rack to cool. Dust a little icing sugar or snow powder to beautify the cakes. Something sweet and delicate for the afternoon tea break. Love the slightly chewy crust with soft and light texture bursting of fruity blueberries in each mini cake. Enjoy ! 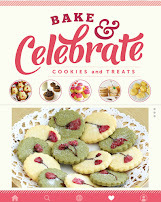 Happy baking and have a wonderful week ahead ^-^! 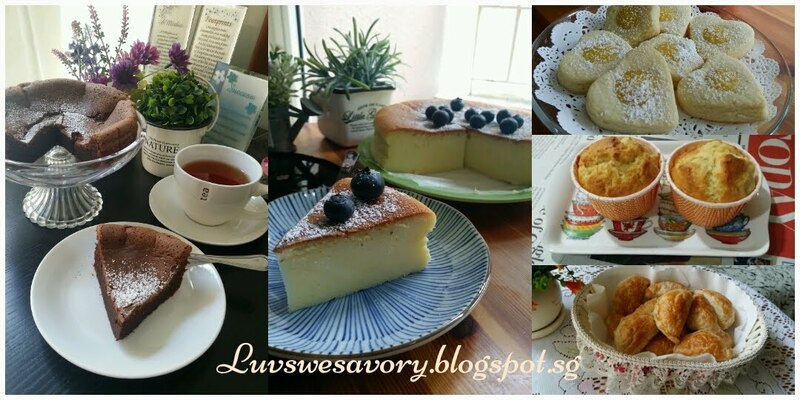 Thanks for the compliment, these light and dainty cakes served great for afternoon coffee/tea break. Karen, I thought I wanted to make some but I ran out of ground almonds. 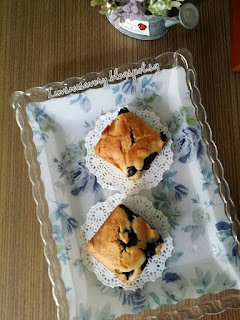 I'll be sure to buy some and bake because your blueberry lemon friands look so yummy! Oh my goodness, I'm salivating over this one. It's gorgeous and I bet oh-so-delicious! Will you be my neighbour, Karen ? <-- my proposal without a ring.